The Contract Data Requirements List (CDRL) is a list of authorized data requirements for a specific procurement that forms part of a contract. 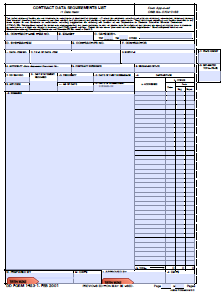 It is comprised of either a single DD Form 1423, or a series of DD Forms 1423 containing data requirements and delivery information. The CDRL is the standard format for identifying potential data requirements in a solicitation, and deliverable data requirements in a contract. DFAR Subpart 215.470 requires the use of the CDRL in solicitations when the contract will require delivery of data. CDRLs should be linked directly to Statement of Work (SOW) tasks and managed by the Program Management Office (PMO) data manager. Data requirements can also be identified in the contract via Special Contract Clauses (e.g., Defense Federal Acquisition Regulations Supplement (DFARS)), which define special data provisions (such as, Rights in Data, Warranty, etc.). The purpose of the CDRL is to provide a standardized method of clearly and unambiguously delineating the Government’s minimum essential data needs. The CDRL groups all of the data requirements in a single place rather than have them scattered throughout the solicitation or contract. A DID is a completed document that defines the data required of a contractor and is included in a CDRL. The document specifically defines the data content, format, and intended use. There are standard DIDs for all topics that can be found in the ASSIST Database by entering their 5-digit DID number or searching for them by inputting “DI” into ASSIST – Quick Search. Q. Is there a website that lists all data item descriptions? Q. Where can I find an online copy of DoD 5010.12-L, “Acquisition Management Systems and Data Requirements Control List (AMSDL)”? A. The AMSDL which formerly listed all DIDs, was canceled in 2007, as all DIDs have been incorporated into the ASSIST database.